Marcel Theo Hall (born April 8, 1964), better known by his stage name Biz Markie, is an American rapper, beatboxer, DJ, actor, comedian, television personality and spokesperson. Hall is best known for his 1989 single "Just a Friend", which became a Top 40 hit in several countries. In 2008, "Just a Friend" made #100 on VH1's list of the 100 greatest hip hop songs of all time. Biz Markie lives in Howard County, Maryland and has helped support County Executive Ken Ulman during his fundraisers. Markie has been called the "Clown Prince of Hip Hop." Markie's career began on Long Island and he graduated from Patchogue Medford High School in 1982. Biz Markie was interviewed in the 1986 cult documentary Big Fun In The Big Town. Markie released his debut album, Goin' Off, in 1988, which attracted a fair amount of attention, largely due to the lead single, "Make the Music With Your Mouth, Biz". The album also featured the underground hit singles "Nobody Beats The Biz", "Vapors", and "Pickin' Boogers". On October 10, 1989, Biz Markie's second studio album, The Biz Never Sleeps, was released on Cold Chillin'/Warner Bros. Records, produced by Biz, his cousin Cool V and Paul C. The single "Just a Friend", in which he alternates between rap and singing, became Markie's most successful single, reaching #9 on the Billboard charts. The song interpolates the 1968 song "You Got What I Need" by singer/songwriter Freddie Scott, whose basic chord and melody provided the base for the song's chorus. "Just A Friend" was ranked 81st on VH1's 100 Greatest One-Hit Wonders in 2000, and later as number 100 on VH1's 100 Greatest Songs of Hip Hop in 2008. The music video, directed by Lionel C. Martin, chronicles the rapper's woman problems. Markie's third studio album I Need a Haircut was released on August 27, 1991, on Cold Chillin'/Warner Bros. Records and was produced by Biz Markie and his cousin Cool V. Sales of the album were already low when Markie was served a lawsuit by Gilbert O'Sullivan, who claimed that the album's "Alone Again" featured an unauthorized sample from his hit "Alone Again (Naturally)". O'Sullivan's claim was upheld in a landmark ruling, Grand Upright Music, Ltd. v. Warner Bros. Records Inc., that altered the landscape of hip-hop, finding that all samples must be cleared with the original artist before being used. In accordance with the ruling, Warner Bros., the parent company of Cold Chillin', had to pull I Need a Haircut from circulation, and all companies had to clear samples with the samples' creators before releasing the records. This development reflected the increasing popularity of hip-hop and the financial stakes over which releases were set. Biz responded in 1993 with the mischievously titled All Samples Cleared!, but his career had been hurt by the publicity emanating from the lawsuit, and the record suffered accordingly. Additional bad news came when the video for the track 'Toilet Stool Rap' was labeled Worst Video of the Year on the Fromage show from Canada's MuchMusic. For the remainder of the decade, Markie occasionally made television appearances, including guest appearances on In Living Color (including as contestant Damian "Foosball" Franklin in the recurring game show sketch "The Dirty Dozens" and as Marlon Cain in "Ed Bacon: Guidance Counselor") and in a 1996 freestyle rap commercial on MTV2. He also made numerous guest appearances with the Beastie Boys on Check Your Head (1992), Ill Communication (1994), Hello Nasty (1998), and their anthology The Sounds of Science (1999). He also rapped on the song "Schizo Jam", on Don Byron's 1998 release, Nu Blaxploitation (Blue Note/Capitol) and worked with Canibus on the first track on the Office Space soundtrack (1999). He also rapped on the track "So Fresh" alongside Slick Rick on Will Smith's 1999 album Willennium. In 1996, Markie appeared on the Red Hot Organization's compilation CD, America is Dying Slowly, alongside Wu-Tang Clan, Coolio, and Fat Joe, among others. The CD, meant to raise awareness of the AIDS epidemic among African American men, was heralded as a masterpiece by The Source magazine. In 1997, Markie appeared on the Rolling Stones' song "Anybody Seen My Baby?" on their album Bridges to Babylon. His part was shortened on some radio versions. Biz also teamed up with Frankie Cutlass on his third single and music video titled "The Cypher Part 3" with some of Marley Marl's Juice Crew veterans. In 1999, Markie appeared on Len's song "Beautiful Day" on their album You Can't Stop the Bum Rush. In 2002, Markie appeared in Men in Black II, with Will Smith and Tommy Lee Jones, essentially playing an alien parody of himself, whose native language sounded exactly like beatboxing. Between 2002 and 2003 he appeared in episode 5 of the TV series Fastlane playing himself as a nightclub DJ. In 2003 he appeared in the international television series titled Kung Faux performing a series of voice over characters featured in a variety of episodes. In 2004, his song Vapors appeared on the soundtrack of Rockstar's popular videogame Grand Theft Auto: San Andreas which featured an old school hip hop radio station, Playback FM. In 2005, Biz detoured from his recording duties to appear on the first season of the television show Celebrity Fit Club which challenged celebrities to lose weight by a combination of diet and exercise. Biz Markie lost more weight than anybody else in the competition. That year, he was also in an episode of The Andy Milonakis Show. Biz Markie was a cast member on Nick Cannon's Wild 'n Out, seasons 1 and 3. Biz also does the beatboxing segment, Biz's Beat of the Day on the Nick Jr. show Yo Gabba Gabba!. 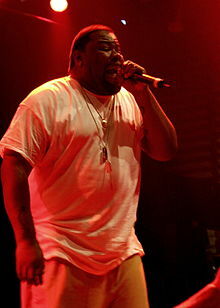 Biz Markie began 2008 opening for Chris Rock's "No Apologies" tour. Biz Markie's act includes spinning records ranging from old school hip hop to Lynyrd Skynyrd and then performing "Just a Friend". Biz Markie's playlist includes the following: "Children's Story" by Slick Rick, "Rapper's Delight" by The Sugarhill Gang, "Billie Jean" by Michael Jackson, "Holiday" by Madonna, "Wake Me Up Before You Go-Go" by Wham!, "It Takes Two" by Rob Base and DJ E-Z Rock, "The Breaks" by Kurtis Blow and "Robot Rock" by Daft Punk. In December 2009, Biz Markie appeared in a RadioShack commercial, repeating the line: "Oh Snap! Guess what I saw!" from his song "Just A Friend". That same year saw his debut with Andy Milonakis in television commercials for the commercial Internet service Tune Up. In 2010, Biz Markie appeared on VH1's 100 Greatest Artists of All Time, providing commentary throughout the series. Biz Markie himself was not included on the list. On November 9, 2010, Biz appeared on The Aquabats! new EP, Radio Down! in the title track. On November 11, 2010, Biz sat in with The Roots on Late Night with Jimmy Fallon, and performed "Just a Friend" with actor Jeff Goldblum. In 2017, Markie appeared several times on the MTV2 game show Hip Hop Squares, a spin-off of the popular game show Hollywood Squares. That same year he made an appearance in the track "2012 (You Must Be Upgraded)" by Oklahoma band The Flaming Lips alongside Ke$ha. In 2013 Markie toured with the Yo Gabba Gabba! live show. That year, his song, "Just a Friend" was featured in Saints Row IV, which included a Pop station 107.77 The Mix FM. He appeared on the CN show Mad, as the Hip Hop Hobbit. He voiced rapper Rhymez and his DJ, Tiny Timmy Scratch It, in the Randy Cunningham: 9th Grade Ninja episode "Hip Hopocalypse Now". He guest starred in the SpongeBob SquarePants episode "Kenny the Cat", in the episode's title role. His voice acting work also includes the voice of Snorlock the Beatboxing Slug in an episode of Adventure Time. In 2014, he appeared in the Syfy network movie Sharknado 2: The Second One. That same year, he threw a ceremonial first pitch for an Oakland Athletics baseball game. In 2016, his song, "Just a Friend" was featured in the Netflix Series Love as an ending theme for episode 4. He also makes an appearance in a song titled "The Noisy Eater" off the album Wildflower by The Avalanches. In 2016, he appeared on the Fox TV series Empire as himself, where he performed the song, "Just A Friend." In 2017, he appeared in the season 3 finale of the ABC series Black-ish. He performed a personal version of the song, "Just a Friend", in which he added the names of the characters. 2010: The Aquabats Radio Down! 1993 "Let Me Turn You On" - - - All Samples Cleared! ^ "Biz Markie: Biography". AllMusic. Retrieved 2008-10-10. ^ Singh, Amrit (September 29, 2008). "VH1′s 100 Greatest Hip-Hop Songs". Stereogum.com. Retrieved July 17, 2014. ^ McPherson, Lindsey (2012-05-01). "Howard County Political Notebook: 'Just a Friend' rapper Biz Markie to headline Ulman fundraiser". baltimoresun.com. Retrieved 2012-12-16. ^ "Biz Markie, the clown prince of hip-hop, found a home at Yo! MTV Raps. | MTV Photo Gallery". Mtv.com. Archived from the original on 2011-06-29. Retrieved 2011-09-12. ^ "• Biz Markie". Hiphop.sh. 2007-08-29. Archived from the original on 2013-12-03. Retrieved 2013-12-19. ^ "Big Fun in the Big Town". 1 January 2000 – via IMDb. ^ Scherman, Tony (August 8, 1999). "RECORDINGS; High-Quality Bubble Gum". The New York Times. Arthur Ochs Sulzberger, Jr. Retrieved August 8, 2018. ^ ""TuneUp Ads feat. Biz Markie & Andy Milonakis"; Tune Up; December 11, 2009". Tuneupmedia.com. 2009-12-11. Retrieved 2011-09-12. ^ Sara Schaefer. "''Performance with Jeff Goldblum on Late Night with Jimmy Fallon''". Latenightwithjimmyfallon.com. Retrieved 2011-09-12. ^ "Yo Gabba Gabba! Live! Official Website". Yogabbagabbalive.com. Archived from the original on 2013-12-19. Retrieved 2013-12-19. ^ "SpongeBob SquarePants: Kenny the Cat: "SpongeBob Superfan"". spongebob.nick.com. Retrieved 2014-03-30. ^ "Behind the Voice Actors: Snorlock". behindthevoiceactors.com. Archived from the original on 2014-06-21. Retrieved 2014-06-20. ^ Littmann, Chris. "Biz Markie throws awkward first pitch". Sporting News. Retrieved 15 July 2018. ^ Iovine, Anna Rose. "Twitter Reacts To Biz Markie's 'Empire' Appearance & They Were Just As Excited As Cookie". Romper. Retrieved 2017-05-11. ^ "Black-ish Ends Its Season With Laughter and Tears". TVGuide.com. 2017-05-10. Retrieved 2017-05-11. ^ "MIMS Album & Song Chart History: Rap Songs". Billboard. Prometheus Global Media. Retrieved August 28, 2012. ^ "Gold & Platinum: Mims". Recording Industry Association of America. Archived from the original on October 17, 2015. Retrieved August 28, 2012. Wikimedia Commons has media related to Biz Markie.